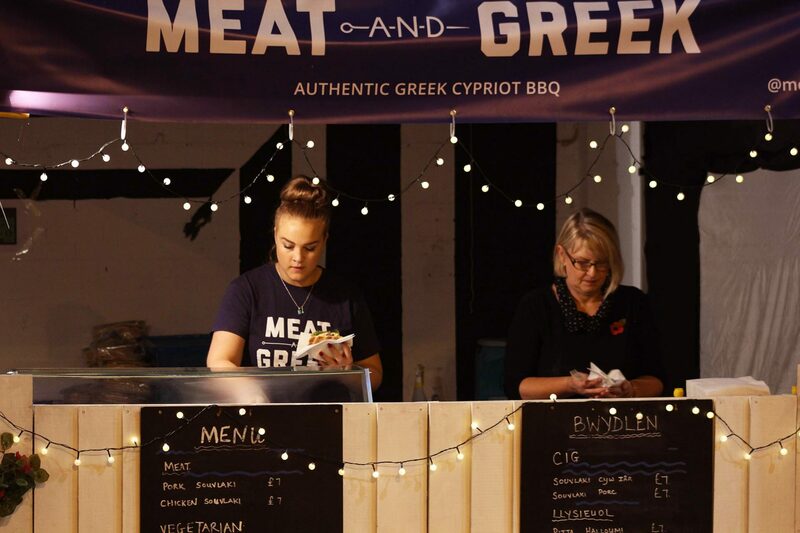 Meat and Greek are a Cardiff based Greek Cypriot family who are passionate about sharing our authentic Greek street food with just about anyone who’ll have us! 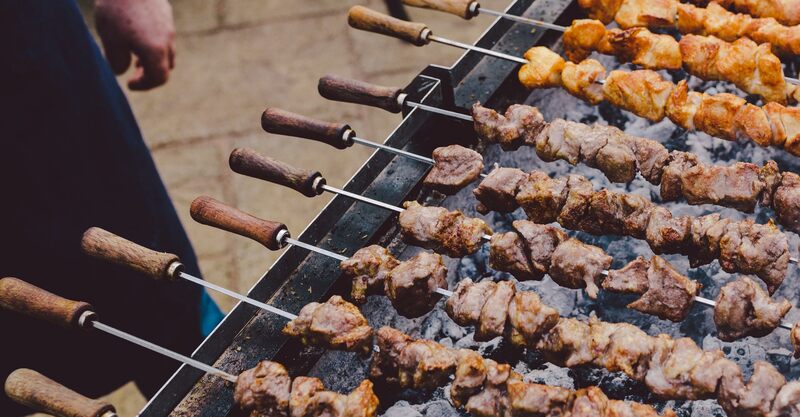 Inspired by the kouzína from the villages of Cyprus, we serve delicious souvlaki fresh from the skewer. What’s souvlaki? Think toasted pitta breads packed with succulent charcoaled chicken or pork, fresh salad, homemade tzatziki, houmous and grilled halloumi cheese, then garnished with chopped onion and parsley – delicious! And if meat’s not your thing, no problem! Swap it for extra halloumi and get stuck in. Greeks don’t do anything by halves, especially food, and we’re proud of the fact that our portions are generous and our ingredients are wholesome. 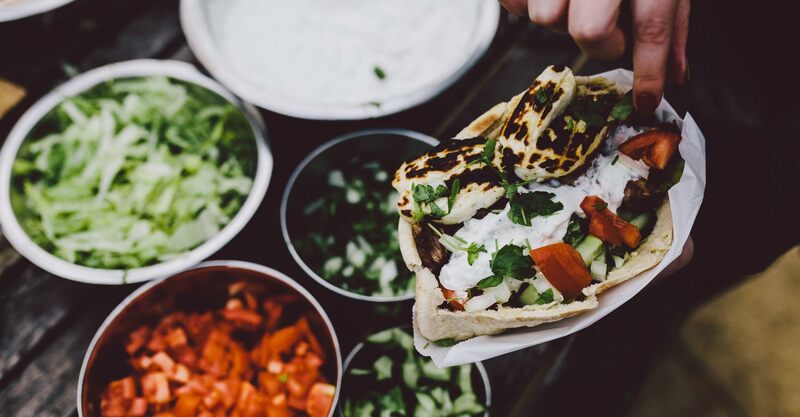 Our mouth-watering souvlaki is made with produce sourced from local suppliers, so you’re getting the best of the Med and the mountains of Wales, an awesome combination, we’re sure you’ll agree. We’re available for festivals, weddings and events big and small – just give us a gathering of hungry people, and we’ll give you flame-grilled Greek goodness with a generous side of Cypriot hospitality (and a big dollop of houmous, just for good measure). Our big blue tents can be set up pretty much anywhere, and can be scaled up or down depending on the size of your event. We’ve done giant concerts, tiny family gatherings, and everything in between, so whoever you’re feeding, just shout us out a yiasou! We’re a family-run business, and you’ll often see three generations in our tent working hard to get you fed. We’re lucky enough to make a living from sharing the food we love to eat with all the amazing people we get to meet – and we hope you can taste our passion for what we do in every bite! You can find out more about our family and the Meat & Greek story here. We hope you’re hungry, because the Greeks are coming! 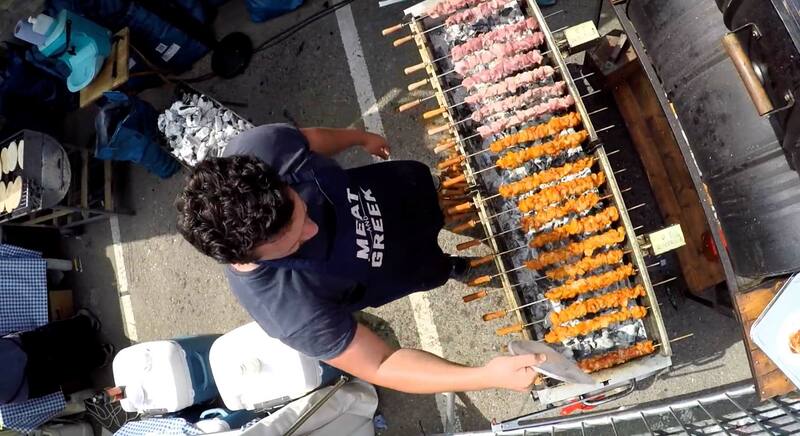 To keep up with the latest Meat and Greek news, Like us on Facebook or Tweet us @meatandgreek.